The Gunstringer got itself a little bit of DLC last week, in case you missed it. The new content is called "REAL BIG SHOOTN'." It's in all caps, so you're supposed to scream when you say it. You can pick it up for a paltry 240 MSP ($3 bucks). The new content will pit you against Mad Dog McDog and offer a variety of shooting gallery challenges that will test your air-pistolling precision. Twisted Pixel does an awesome job with their dev blogs, and I don't want to tread all over designer Dan Teasdale's excellent announcement post. You should head on over to their site check out his game pimpin' skillz. At one point he alludes to scratching a 25 year old itch. While I don't know for certain, I imagine that this particular itch has been bothering some gamers for about 26 years, 2 months, and 2 days. But who's counting? Check out the following video for more details. The Gunstringer and the "REAL BIG SHOOTN'" DLC is available now for the Xbox 360. 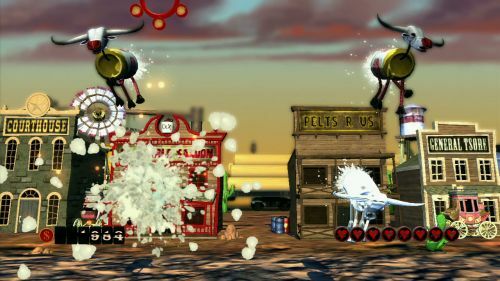 The game supports two player local co-op. Page created in 0.3233 seconds.